The finding of large bowel being located between the liver and diaphragm is known as Chilaiditi’s sign. However if the patient is symptomatic with the abnormal positioning it is known as Chilaiditi’s Syndrome. Chilaiditi’s sign and syndrome were first described in 1910. 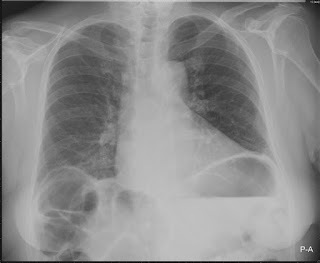 The radiographic finding on plain film can easily be mistaken for pneumoperitoneum as the air contained in the large bowel is resting just beneath the diaphragm giving the appearance of pneumoperitoneum. However the air is actually contained within the abnormally positioned bowel and is not true free air under the diaphragm. As such, Chilaiditi’s sign is one of the causes of pseudopneumoperitoneum. In an individual with Chilaiditi’s sign, the identification of true pneumoperitoneum on plain film is very difficult to determine. The abnormally located colon can cause symptoms such as abdominal pain, respiratory symptoms, or can be an incidental finding. In a patient with Chilaiditi’s sign, it does make identification of true peumoperitoneum very difficult on plain film as it is difficult to determine true free air versus air contained in the abnormally located bowel. Management of these patients is typically conservative and supportive care. However if the patient has additional acute surgical pathology such as an obstruction, volvulus or ischemic bowel, then operative management is indicated. In our patient case above, the patient did not have any additional acute surgical pathology noted on his CT scan. He was observed for several hours in the emergency department with fluids and pain medications. His symptoms gradually improved over several hours and he was discharged home with return precautions. His CT findings were discussed with the general surgery team after a discussion with the radiologist. The patient was given follow up in the general surgery clinic; however, he was lost to follow up. 1: Rohman L, Jones A. Chilaiditi's sign. Emerg Med J. 2012;29(1):86. 3:Wong VW, Yuk-wah liu S, Wai-yan chiu P, Kin-hung wong S, Kwok-wai ng E. Chilaiditi's syndrome: a nonemergent cause of "free gas under diaphragm". Am J Surg. 2009;198(2):e25-6.